Is This An Adjective Which I See Before Me? 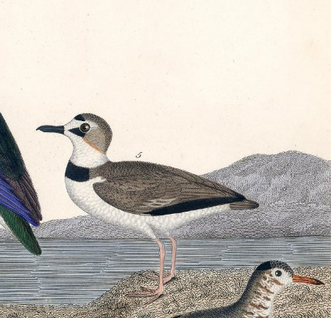 It was two centuries ago this summer, just a year after the death of his “ever-regretted friend,” that George Ord published the first scientific description of the bird he honored with the name of the Wilson’s plover. Ord commemorated his late colleague in both the English name and the scientific name of the new species, assigning it the Linnaean binomial Charadrius wilsonia. Ten years later, he changed his mind. Not about Alexander Wilson’s considerable merit, and not about the suitability of “this neat and prettily marked species” as a monument to the American Ornithologist; but rather about the proper form of the bird’s scientific name. In the second edition of Volume Nine, and then in the three-volume edition of Wilson’s work published in 1829, Ord — accepting without comment a change first made by Vieillot in 1818 — alters the epithet, from his original wilsonia to wilsonius. original spellings will be used in all scientific names. just as had been the case before 1944. Oddly, though, that exception was not applied to the plover, which on being returned after some decades of exile to the grammatically masculine genus Charadrius, nevertheless retained, and retains today, the grammatically feminine epithet wilsonia. if the gender ending is incorrect it must be changed accordingly (34.2). 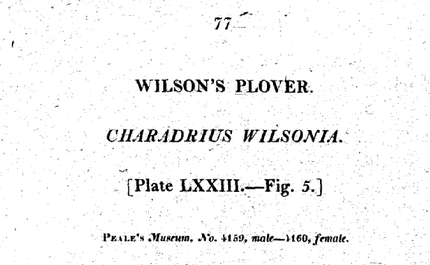 If I read this correctly, then the name of the Wilson’s plover should rightly be Charadrius wilsonius Ord 1814; wilsonia should be rejected as improperly formed. Unless, of course, the ICZN has issued a special dispensation permitting the retention of the ungrammatical name. I can’t find such a document, but maybe it’s out there — or maybe I’ve missed something obvious. Where the author of a species-group name did not indicate whether he or she regarded it as a noun or as an adjective, and where it may be regarded as either and the evidence of usage is not decisive, it is to be treated as a noun in apposition to the name of its genus. Does anyone know who decided, when and on what basis, “wilsonia” was a noun? What am I overlooking here? On the 201st anniversary of the death of Alexander Wilson — with thanks to David and Ted for good discussions.